Color is at once one of the most common features of our perceptual experience and one of the most puzzling. Is it in our minds or in the world? Do all people see colors in the same way, or do linguistic categories and cultural associations influence how we experience particular hues? How do particular colors become associated with particular identities, such that blue is gendered male, and muted colors signify refinement while highlighter tints scream “hipster”? And how have modern writers and artists incorporated the sensory power and cultural complexity of color into their work? 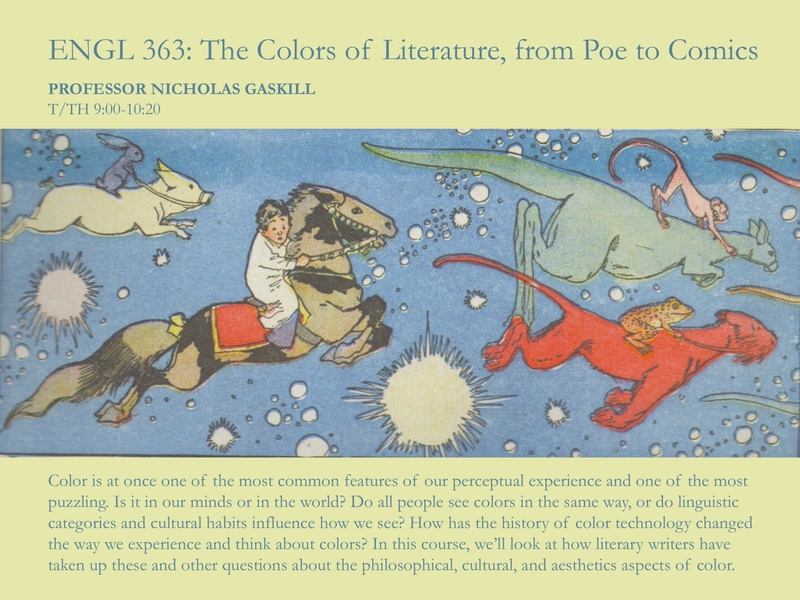 In this course, we will look at how literary writers have taken up these and other questions about the philosophical, cultural, and aesthetic aspects of color. After familiarizing ourselves with some important accounts of color’s cultural history (discussing, for instance, how people in the West so persistently treat color as both alluring and threatening), we will turn to three units on color and literature, focusing on poetry, prose, and comics respectively. In the first, we will look at the fascination with color that characterizes experimental poetics from the Symbolists through Gertrude Stein and William Carlos Williams to Maggie Nelson’s Bluets. The second unit will explore prose experiments with color, beginning with Poe and then moving to Stephen Crane’s The Red Badge of Courage, meditations on color and race in the Harlem Renaissance, and H. P. Lovecraft’s “The Colour Out of Space.” We will end the course with a unit on image-text hybrids, including the first edition of The Wonderful Wizard of Oz (written by L. Frank Baum and illustrated by W. W. Denslow), Winsor McCay’s early comic strip Little Nemo in Slumberland, and more recent graphic narratives. Throughout the semester we will discuss the philosophical, commercial, and artistic contexts for these literary engagements with color, including writing by Goethe and Wittgenstein and paintings by Whistler, Cézanne, and Matisse.